The EU's chief negotiator's upbeat tone on the possibility of an imminent Brexit deal makes a number of Tuesday's front pages. 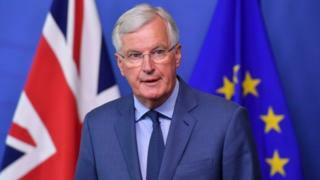 Michel Barnier switches his demeanour as easily as an actor in ancient Greece swapping between the masks of tragedy and comedy, says the Daily Express. Meanwhile the i paper reports that Mr Barnier's comments triggered a rise in the value of the pound and that a "save Theresa" operation has been launched by European leaders amid fears Boris Johnson is after her job. Mr Johnson continues to get column inches, with the Mirror describing him as a selfish, egotistical maniac whose poisonous personal vanity is creating a major roadblock to a decent Brexit deal for Britain. Writing in the Times, Rachel Sylvester says the announcement that Boris Johnson is getting divorced is irrelevant to those beyond his family. What matters, she says, is the amorality of his politics. There are pictures aplenty of a smiling Alastair Cook on the front and back pages of many of Tuesday's papers. Cook - who notched up 147 runs in his final Test innings against India at the Oval - exudes professionalism and quiet charm, according to the Daily Mail. Describing Cook as a devoted family man who eschews the boozy nightclub culture enjoyed by some of his colleagues, it asks: could there be a better role model than the record-breaking batsman? It used to be associated with casseroles and bingo but Labour is now seen as the party of quinoa and student protests. That's according to a study of swing voters in marginal constituencies detailed in the Guardian. The research suggests many voters have gone from viewing Labour as the pie-and-pint party of the working class to one of students at demos. A balance of just 17% said the party was good at representing traditional Labour values. The article does note, however, that Labour now has a membership of more than half a million. The Guardian says women in the UK are living shorter lives on average than most of their counterparts in Europe. Citing a detailed analysis of the health of the nation by Public Health England, it says the average lifespan of a British woman is 83, taking 17th place out of 28 EU nations. Men in the UK do better, in 10th place and with an above-average life expectancy of 79.4 years, but the Times points out that dementia - already the biggest killer of women - will soon take just as great a toll on men. In its lead editorial, the Daily Express says it's obscene that in a country as rich as ours we have such appalling health problems coming down the line. It says if we don't act on these warnings there is a health time bomb waiting to go off. And finally, the Telegraph has published a list of street slang compiled by police on the Fylde coast in Lancashire to help their neighbourhood officers understand the terms and phrases used by teenagers. It states that "beef-ting fam" means "starting an argument" while "peng" means "good or attractive". "Wag-wan" is shorthand for "hello, how are you" and "swear down" means "tell the truth". The list also points out that Stormzy is a rapper from south London and not a meteorological term.